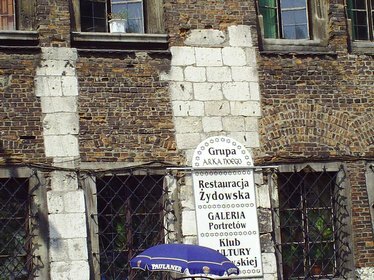 Jewish Krakow – Do Jews still live in Poland? I would love to write in more detail about this but I thought I would start off a post on Krakow Jewish life. Do any Jews still live in Krakow Poland? This is a good question. I live in the old Jewish ghetto of Krakow. My street was the border where the wall divided the Jewish ghetto with the other part. I have be casually reading about the history of Jewish Krakow for about seven years. I am not an expert but how can I not have an interest if I live here? I have many stories that really are other worldly I would like to write about, but this post is less ambitious. It is simply to explain that yes Yiddish and Hebrew is spoken on the street and among the tourists and there are Jews living in Krakow. The flag of Israel proudly flies along the Polish and American flags in Krakow. 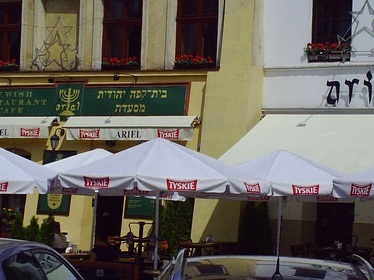 Often times the question comes up, do any Jewish people live in Krakow? And if so what is it like for them? The answer is there are about 100 active Jews here, going to synagogue and observing the rites. However, I would say 1000s of inactive Jews in Krakow. Many people here are Jewish or were born of Jewish mothers and converted to Christianity for obvious reason. Remember about 25% of the city was Jewish, 60,000 people and back then that was a lot of people. Plus all over the coutryside there were people living and this number is often ignored and would bring the figure much higher if ou include the metropolitian area. Many of my students in Krakow have told me they have a Jewish grandmother or something. I would say about 15% of my Polish students have some Jewish blood. The owners of my building are Jewish. 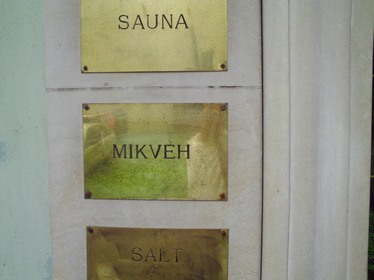 The owners of my friends building are Jewish and come to Krakow sometimes for a long-term stay. I know Jews from England and other places that have set up businesses etc in Kazimierz. There are also over a million Jewish tourists to Kraków every year. So even though there are a few thousand inactive Jews in Krakow and about 100 active Jews here do not believe the numbers. There are thousands of Jews from all over the world everyday visiting as this is an important city of culture. Their ancestors lived here as long as the Poles did in peace. This is why in my opinion is an important Jewish city today. You can buy a Yamaka in Krakow on the street no problem. What is life like for a Jewish person in Krakow? I think it is like anywhere, the focus is on observing the law of God, living peacefully and in community. I think Krakow is like 19th century Jewish city. If you live here and are not a just coming through you will see how magical it really is. It is like a time machine. In fact, irony is people have written articles telling people not to come to here as they do not want to spoil this too hidden gem of a city. Maybe, I am a bit guilting of telling people not to come here as I do not want to spoil it myself as it is not too commerical, at least yet. A lot going on every week at an active community center. My point is this is an active living comminity. You do not have to view photos of 100 years ago to get a sense of what life was like here. It is a live today. 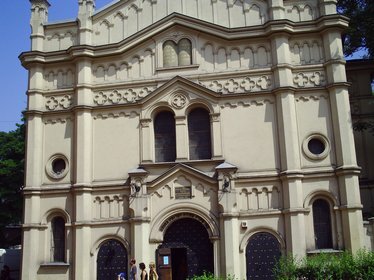 Do Jewish people experience problems in Krakow? Did you know if you make a remark to someone based on religion or country of origin etc in Poland it is 2 years in prison? Article 67 of the Polish law protects rights and if you look into Polish law you will find if someone even makes a comment or remark about you in a bad way based on who you are you will get two years. The Police are very strict about this because of the history and the connection with Israel. Maybe someone has experienced problems but I have never heard of it personally. For sure there are some guys who live in the blocks in the bad section of town, that hold less than enlightened ideas in their small brains, but this is everywhere in the world not just Poland. I was out the other day with my camera. There are not professional photos but just some I took while I was in Kazimierz waiting to get a haircut. 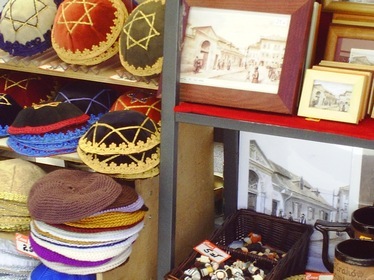 You can decide for yourself if in Kazimierz or any other part of Krakow, if there are any traces of Jewish culture. Jagiellonian University is where people study Hebrew and about Jewish culture. I can not even begin to go into the history as it is beyond the scope of this post. Small holocaust memorials are in many places in Krakow - God bless the souls of the departed. 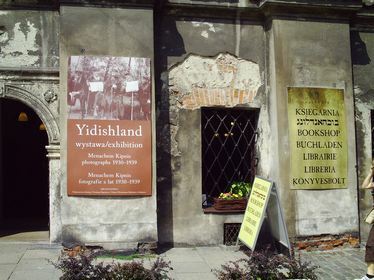 There are book shops you can buy Hebrew, Yiddish English and Polish language books about Jewish culture in Krakow. Orthodox or conservative rituals of cleasing are important. In fact, I heard this one of the first thing that was built in the community here. It makes sense as you should be pure in body and mind to ask for God’s wisdom to build a new community. I think most people cook at home, but it always helps if you have somewhere to go when you want to go out. Do you like Yiddish food or want a Kosher meal? There are shops and restaurants in Kazimesh. Even the big commercial shops have Kosher food, just like in the USA. 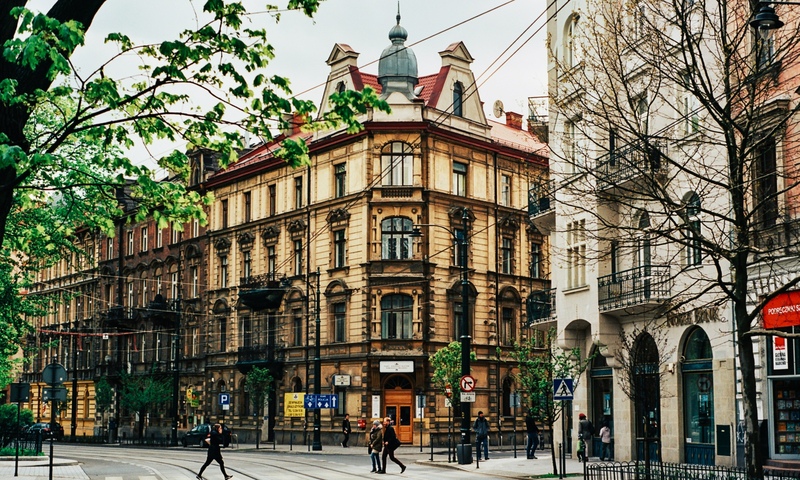 There is plenty of art in Krakow with Jewish themes lie in these buildings. Kazimesh has it all when it comes to culture. But after about a couple of weeks you might see all the tourist things and then take a few years to settle in and enjoy the atmosphere. These small Jewish shops in Krakow make you feel like your in another century. I would be more than happy to answer any questions if you are coming to Krakow. I am not Jewish. I am an American Catholic and Polish also. However, if you have any questions about Jewish Krakow or Poland in general I will do my best to answer them. I live in Israel the last 50 years, lately I renewed my Polish passport and I and my wife consider to move to Krakow for a year or two, to travel around and discover the roots of my family,and to experience the life in Krakow. Is there a Jewish comunity center where I can find friends? Are there Israelis like me in Krakow or somewhere else in Poland? I will appriciate your answer. Joseph. I think there are like a million Jewish visitors a year to Krakow. Everyday I see many people from all over the world. But also there is a small community of Jews who live all year around in Krakow. If you want to connect with others you will have no problem. I am not Jewish, but I live here and the people are very nice. I think you will like your experience of living in Poland. If you have any problem when you are here I can connect you with people. You are welcome from Krakow. If you have any questions about Krakow or Jewish Krakow just write. This March will be my fourth year coming to Dobczyce Poland to teach English in the schools. I am a Jewish orthodontist from Michigan that has served on Michigan’s school board for 13 years, the last two as president. During my last visit to Dobczyce I was able to locate the remains of the Mikvah although the synagogue was destroyed by the Nazis. I just contacted the Jewish Center, Eliza, in Krakow to see if I can obtain some assistance to commemorate, preserve and memorialize the remains. Any assistance or advice you can give me would be appreciated. PPPS your website is outstanding. Europe is not the place I (a Jewess) would put myself. Jews have 3 options left: Israel, Asia and Canada (the latter, “for now”). What about the United States? Everyone knows the US is the golden median. We don’t need Israel because we have New York, LA, and Miami. What about America? At the end of the day it’s our homeland. Shalom Mark.. Another great site of yours I found by googling.. Amazing how visible you are on the web. Krakow is a place of so much, almost ancient, history for the Jewish people. It is also a place of many sorrows and place were so many atrocities happened. It is hard to believe that more Jews lived in Poland than New York, only about 100 years ago. Anyway, I do hope that the Jews can revive their communities and perhaps the Jewish culture of Krakow can be brought back to its glory before The Shoah. Most likely it won’t. However, many Israelis don’t like being stuck in Israel, this is not a joke. Israel is a very small country as well and it would be hard to contain the population forever, unless we reclaim our ancient lands, which won’t happen anytime soon. If the Polish government would accommodate these Jews by giving them citizenship, many may be eager to live in Poland and help support Poland, as well as bring to life a new Polish Jewish community. As of now, Poland has 50,000 Jews.. A lot less than the 3,000,000 or so that lived there prior to WWII. I am eager to experience Krakow’s Jewish community in Kazimierz and I don’t want to miss the Jewish festival. I am reading it is every 2 years. I think many Jews from around the world are rediscovering their European roots. It was kind of an unofficial homeland for Jews for about 500 years when there was no Israel. That is when they fled other parts of Europe they thrived in Poland. They set up Synagogue, schools, businesses, and debated the Torah. When you are in Krakow you can feel this history. I think if a Jewish person who has roots in Poland and wants citizenship has the same chance under Polish law to get EU citizenship as any person of Polish ancestry. I think it just takes a lot of work and commitment. Many ethic Poles go to Israel by the way as the weather is warm and sunny and earnings are relatively better and I think the two countries have a pretty good relationship. It is funny when I went to visit Israel, the people traveling on Polish passports, had no problem crossing the border. But I used my American passport at the time and they really check me out good and gave me 101 questions. I would have thought the opposite to be true, but it just goes to show you perception is not always reality. But in all fairness I think it was because I was the odd one out traveling from Poland. 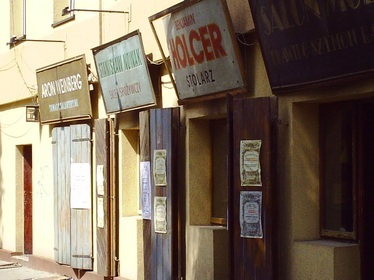 You have to see Kazimierz, it is really like a small 19th century Jewish town, that is alive today. We just arrived in Poland today. We are Jewish and our grandparents are from Poland. I was wondering if there were Jewish people in Poland and that is why I accessed your blog. I think you are right. Jewish people all trying to find their roots, and although Poland has been a difficult place for Jews in WWII, I wanted to see what it was like here. I am not very religious, but wanted to see what Poland was all about. I was also an interviewer for The Shoah Foundation, Stephen Speilberg. Krakow is a beautiful town, and I thank you for your kind comments. I hope that Krakow would one day fourish with Jewish people. We had dinner in Kasmariz (spelling) this evening and saw a Klesmer band…the food was typical Jewish, but I was sad because you could see what it used to be like here for the Jewish community, with the sights, tastes, smells and even the furniture of the place we went to. But one thing was missing…the actual Jewish people…that I was sad for. I think Jewish people are coming back to Krakow. Further, many Poles have Jewish roots themselves and are rediscovering this. I mean many of my students have at last one Jewish grandparent. Further, like you many Jewish people are not religious so you can not notice them, even if they live here. I only know when they tell me they are Jewish or part Jewish because I know them personally.. It is like Jewish people in the USA. Growing up, I could see more people as they were more traditional and religious, but now society has changed and there is no big difference, uniculture. If you have any questions, please let me know. I live right here in the heart of Krakow. There are a lot of good walks connected to Jewish history few people go. 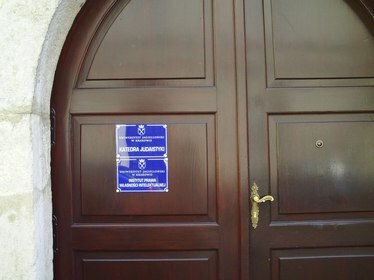 For example next door to me was a Synagogue during the ghetto occupation most people do not know about. Yes especially in the Jewish quarter there are hotels and traditional food shops run by Jewish people. I’m Delighted to learn this. There is a side of my family name – Rabinowitz, who as the story goes were from Minsk , Belarus. I have not seen this name much outside of of New York. The suffix “witz” I believe has meaning, “Son of” or something like that. And information is appreciated. My grandmother’s father was a hotelier in Krakow: his last name was Molner. He had 7 daughters. Do you have any information on this family? My name is Jonathan Ornstein and I’m the director of the Jewish Community Centre in Krakow.I would like to thank you for your insightful piece about contemporary Jewish life in our beautiful city. Most people have very little idea that there is a thriving, growing Jewish community here and are all too focussed on the difficult, often tragic past. I’d love to invite you to the JCC and have a chance to talk to you about your observations. Please contact me if you are interested and have some time. We came from Israel to Poland year and a half ago and we enjoy living in Poland very much. Krakow is beautiful and charming city and it seems that people always celebrate there. I think also there are that many of the Polish people have Jewish roots and they are interested to discover them now. It was amazing for me, since in Israel you’re being taught that the Jews that had survived WWII left Poland after the war. Thanks for your blog and I have a blog too – tanyasolodar.com, may be it will be interesting to you. Tanya, your blog on healing is very interesting by the way, and I noticed it is in Polish and English, so your Polish must be good. About Poland it is a wonderful place to live and to explore. I have lived here many years and am not tired of it yet. Israel is also beautiful. I think the dream is to live in Poland and vacation in the winter in Israel maybe. Jews lived in Poland for hundreds of years and there is no way that they did not become part of Eastern European people and culture and the visa versa also. I have met many Poles with Jewish ancestry. Just returned from a trip and here is my review – have been in Krakow for the Jewish Festival and am pleasantly surprised to see that there are a lot of life in Kazimierz. I have attended a few concerts, which the Concert of the three Chazanims in the Tempel Synagogue, also I have visited old cemetery with the grave of Rabbi Remu (which I would like to know more) otherwise it was a nice trip to the Old Jewish world. Shalom. Thank you for your great website on Krakow. My grandparents are from Krakow and I am interested in perhaps spending time there teaching English. I am a Polish citizen but not fluent in Polish. Any advice? If you never taught before you can start with a Callan school for example, you can pick up the style pretty easy. My husband and I, we both Jewish are going to travel to Krakow during Passover, April 10th. 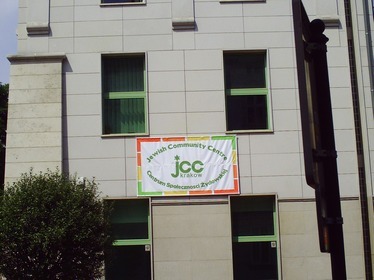 We would like to know an address to contact the Jewish community center in order to attend the festivity. Would you please send me an email address and with whom to talk with? Many thanks and we thank you for spreading your knowledge about the city. I have just visited Poland with my three nephews for only three days and have found that Poland is doing as much as it can in keeping its Jewish heritage and its Jewish culture alive. I was pleasantly surprised by the beauty of Krakow and Lublin and by being able to touch my Jewish heritage almost everywhere I went. I am a direct descendant of the Ramu and the Seer of Lublin and felt a special attachment when I was able to see the reverence which my very informed guide Marta showed when she found out that I was descended from the Ramu. I was in Poland for too short a time in the bitter cold and snow, yet found the beauty in the ancient cities. I would like to go back again and further explore my Jewish heritage here, and the ancient heritage of so many Jews. I’m an American and interested in visiting Krakow and the Jewish areas including Auschwitz and Majdanek and Lublin. I’m not Jewish, but I’m very interested in the tragedies of the Jewish people in Poland. Is November an okay time to visit? I’d probably be traveling alone. Poland is on my bucket list. Anytime is good and Krakow is friendly for foreigners and is safe. You will be safe and being alone is fine to travel around Poland. Really? I think you need to be more forthcoming. Jews in Poland have endured pogroms, the Holocaust (Catholic Poles were quite happy to turn in their Jewish neighbors). Poland needs to join the civilized world. We are all God’s children. Yes, including Jewish people. We are a proud nation with a strong and proud Jewish State. The tens of thousands of dislikers in Poland who protested this weekend can scream at the walls. We hear them but are not listening. Peace and love are always better than racism and hate. I feel sorry for people with so much dislike in their hearts. You are trying to spin it into something I am not and Poland is not. Technically I am of Jewish blood like so many Poles. How many years have you personally lived in Poland? Jewish life is very alive and harmonious with Poland. Maybe you have a need to feel right but you have not read your history. Poles helped Jews escape. I know the personally both Jewish and Catholic in the building where I lived in what was once the Jewish ghetto. I personally know the people and the are and the history not from some media portrayal. Remember my blood is Jewish and I lived in Poland. Oh boy, did we ever start on the wrong foot. I absolutely meant no offense what so ever by my question. It was a question of curiostity. I visited Krakow and stayed in the Kazameire(?) distric. This was more by coincidence than planning. However I am a secular Jew and was deeply touched the area. I asked the quetion to learn whether there still a a thriving Jewish community regardless of size, and no more. I am delighted to be informed that there is. Thank you. I visited Krakow last November (2017) staying in Kazimierz. I came with my husband & although not Jewish again like many people I have an affinity with the faith & massive interest in Jewish culture & history. Staying in Kazimierz was the right thing to do. We stayed at a delightful Jewish hotel – Eden & I can highly recommend it. I am so glad we stayed here & not at one of the big chain hotels in central Krakow. We certainly experienced a lot of Jewish culture visiting Galicia Jewish museum, Schindler’s factory across the river Vistula on Zablocie, the old ghetto wall & ghetto square on Podgorze, as well as several synagogues. We spent an entire day visiting Auschwitz-Birkenau – which will stay in my mind forever. If you visit Auschwitz – please take the advice I was given…do NOT book a guided tour where you will be herded round like cattle quickly with little time to stop & reflect. We slowly went round digesting it all & you need time to do so. It is harrowing & nothing prepares you – we have all seen numerous documentaries & films including Schindler’s List, but to see Auschwitz-Birkenau in real life was just mind-blowing. Incredibly sad but a trip that I believe everyone should do so we remember & know never to discriminate in the name of faith, race, colour, sexuality etc. What I didn’t like about Auschwitz was that it does seem somewhat sanitised & commercial. Did it really need to have McDonalds so close by? & don’t get me started on teenagers & young people taking selfies & smiling YES SMILING!!!! The weather was cold but not as cold as it gets in December, January, February. I was not going to moan about the cold biting winds at Birkenau when I think of what those that were imprisoned there were exposed to. Please visit. The Polish people we met were fantastically friendly – we also met several Jewish people living in the area. I understand there is a tour of the Jewish Community of Lodz. Do you know anything of the community there? I’d be interested in touring this area because there were a number of Cuber’s (pronounced Shuber–my family surname) prior to the shoah. I am a retired American secular Jew living in Ireland (of all places) and an Irish citizen. I have been thinking of relocating to Poland. Since I’m “EU” would moving be easier? I believe I’d be able to continue receiving my American Social security and Irish pension without any difficulty. I am also disabled. Blind and with a heart condition. I would be on my own. Whatever advice you can offer would be greatly appreciated. I am not giving advice but, I believe your geographical tax home does not affect your ability to receive a pension or social security, it is just a different set of accounting rules. Personally I would not spend one Shekel in that place. My Ancestors perished in the most hideous way imaginable, spurred on by the Poles, Lithuanians. I owe it to the memory of my Ancestors not to enrich in anyway that sad place of death and misery in the Memory of my beloved deceased Ancestors Z.B. Ukrainians perished Poles perished, good Germans perished and Jews perished almost 3/4 of a century ago in that war. We could go back further in History and outline many struggles of many people. We are not races but all children of God building a better future. Why were my comments altered? The “Nationalists” are not “dislikers”. They are haters. That is the difference. After what happened during the Shoah, we owe it to our Ancestors to say it how it is. Hate is worse than “dislike” – with horrific consequences which the Jewish people bore during WW2. You see to be full of anger and I will delete any comments that fuel anger. If you want that build your own website and make your your website. My site is to promote unity and peace. I was born in Lwów, re-settled to Katowice in 1945, left for ISRAEL in 1957, left to study in California in ‘61, moved to Vienna in ‘76 where I was Concertmaster for 25 years (ORF) and returned to USA in 2004. I get my pension from Austria without any problem. There is a reciprocal agreement for EU an USA citizens that prevents a double taxation so you can live anywhere w/o loosing your benefits. I know exactly how I, a Jewish woman am perceived in Poland. I did not need reminding by the Nationalists this weekend. I love Canada and would never visit anywhere in E. Europe especially Poland, Lithuania, etc. I travel to Asia all the time where I don’t have to look over my shoulder. Am Yisrael Chai. I’m also Jewish and living in Vancouver, B.C. 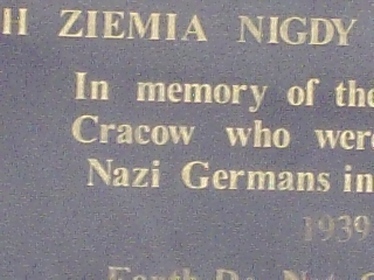 (Canada) and my grandparents were from Cracow. My grandmother was able to survive the war because Polish farmers in the countryside hid her from the Nazis and kept her safe. My grandfather was able to survive the war because a non Jewish Polish woman took him in and hid him and kept him safe. There were many many Poles who risked their lives to save Jewish people. Interestingly enough, the American government refused to bomb the railroad tracks leading to the concentration camps, despite knowing about the gas chambers and mass murder. The American government had no problem with Jews being murdered during the Holocaust. Anyways,Cracow is a gorgeous city and I would vacation in Poland way before going to the garbage dump that we have south of our border. My father was born in Cracow in 1912; his mother’s maiden name was Molkner. My great grandfather was supposedly a wealthy hotel owner in Cracow. He had 7 daughters, one of which, Helen, my grandmother came to US in 1914. I would like to know any information you have of the Molkner family in Cracow. Thank you.